Rupert Shepherd tells us about some of the challenges he faces as the Horniman Museum’s Documentation Manager, why they matter, and raising documentation’s profile. Documentation ensures that a museum is able to account for its collections and everything that happens to them, and manages the museum’s collection-related information. It is as central to a museum as its objects: without it, they are a meaningless pile of odds and ends. The Horniman Museum and Gardens is not particularly large in numerical terms: we have about 350,000 objects in our natural history, anthropology, and musical instrument collections, represented by about 135,000 records in our collections management system, Mimsy XG. But documentation is as crucial here as it is in bigger museums. We’re fortunate in that our accession registers date back to 1899, when Frederick Horniman’s collection was being readied for its transfer to the London County Council. But there are gaps. The early collection’s provenance before 1899 is not always clear. Between 1938 and 1958, the registers were replaced by copies of quarterly acquisition reports to the LCC, lacking itemised lists of many acquisitions, without any numbers allocated to the objects, and arranged in two parallel series (gifts and purchases). 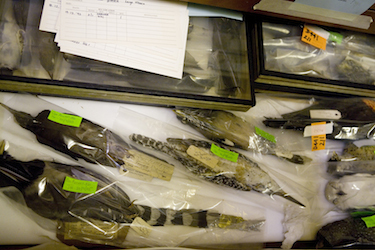 Many large natural history collections were simply registered in bulk. Over the years, we have tried to rectify these defects. Our musical instruments were reviewed and in some cases newly-registered after they were split from the anthropology collection in 1960. Our extensive handling collection, never formally documented, was reviewed and numbered in 1999. Much of the anthropology collection was reviewed in 2001. All the natural history objects on display were listed and assigned temporary numbers when we were planning to redisplay their gallery in 2007-8. But the end result has not been entirely helpful: all these reviews, often conducted under intense time pressure, have resulted in the allocation of over 20,000 temporary numbers to objects and the consequent duplication of records. At the same time, like many organisations the Horniman has expanded its records from register entries into index cards, then onto catalogue cards, then imported them into an early database, then through two earlier versions into our current system. Every stage provided an opportunity for inaccuracies to creep in, or data to be kludged in order to get something running in a reasonable time. Over the last two years, we’ve been reviewing our collections again: our Collections People Stories project will identify and provide a basic level of information for 30,000 anthropology objects, and Bioblitz has identified the most and least important natural history specimens. These have helped – but their need for hundreds of new authority entries has left the core documentation team stretched; both projects have thrown up thousands of objects needing to be marked, measured, repacked, have their database records merged, etc; and Bioblitz has revealed the desirability of listing our extensive natural history collections in greater detail. Why are these problems significant? We’ve seen that documentation is important: without it, we don’t know what our objects are and where they come from, and cannot meaningfully display them or help people understand them. As Angela Kipp, of the Registrar Trek blog, has said: ‘without documentation, humanity loses its memory’, and ‘losing your memory means losing yourself’. More practically, in the current funding climate, we have to work as effectively as possible. Poor documentation hinders this, really good documentation enables it. Yet who, beyond our immediate colleagues, realises this? I asked myself this after three recent incidents. First, I came across a collecting box at a London national museum which allowed visitors to choose between funding conservation or education – but not documentation. Second, I overheard someone remark that ‘everyone loves a conservation blog’. Documentation (and collections management) also makes a significant contribution to many aspects of the museum’s work; might the public not find them interesting, too, if given the chance? Third, I found that some people felt the #AskTheCurator hashtag used during Twitter’s recent Museum Week didn’t do justice to the range of expertise across museums: curators are not the only knowledgeable people working there. These incidents made me think: documentation seldom appears in public discussions of what museums do. There’s been an intensive discussion about whether this matters in Collections Trust’s Collections Management group on LinkedIn. This divided into two camps: those who feel that it’s not worth raising documentation’s profile to the public, because it’s a technical process and the public outputs like displays, exhibitions, engagement or learning events are what’s important; and those who think that it is worth publicising documentation for its own sake, both amongst our colleagues and more widely. I fall into the second group, because people cannot understand the importance of, let alone consider funding, something if they do not know it exists. As a first step, I’ve issued a challenge via LinkedIn and Twitter: everyone working in museum documentation who has a Twitter account should tweet what they’ve been doing each day, and, crucially, why it’s important, using the hashtag #MuseumDocumentation. This is not always easy: I’ve found the experience of saying why what I do matters, in a new way every day, quite challenging – but also stimulating. But there’s been a steady stream of #MuseumDocumentation tweets since the new year: for example, our own ‏@rachisaurus’s ‘Spent the day deciphering stratigraphy abbreviations used by curators in the early 1900s, so that our data makes sense!’ or ‏@PortsCityMuseum’s ‘Hooray, just finished cataloguing the William Endean collection […], now we can use it for #WW1 #LestWeForget exhibition’. I’d like to thank everyone who’s contributed so far – and encourage everyone else to join in. Hopefully, raising documentation’s profile like this will make it easier to support and fund the work needed at the Horniman, and in other museums, to get our documentation as good as possible, so we can all work as efficiently as possible and tell the world everything we know about our stunning collections.